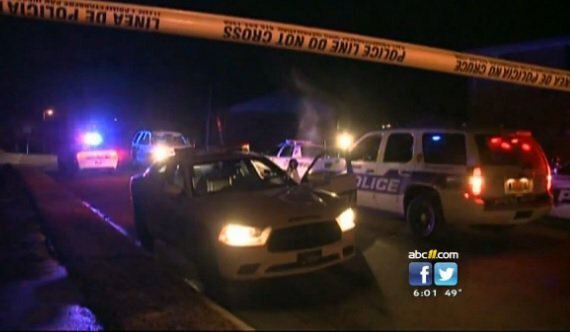 Less than a week after two New York City policemen were executed as they sat in their patrol car by a black man seeking revenge for the recent deaths of Black criminals who were resisting arrest, a Durham, North Carolina policeman is lucky to be alive after six shots were fired at him on Christmas night. The officer was shot as he got out of his patrol car to speak to two black men approaching his car from the rear. Officer J.T. West was said by police to be working on a report in his patrol car around 10 p.m. when he saw two Black men walking up behind him from an abandoned apartment building he was patrolling. As he got out to speak to the men one of them pulled out a gun from his waistband and opened fire on the officer. All six shots fired by the gunman missed the officer with one hitting the driver’s side door of the patrol car. No words were exchanged with any of the three men. The officer squeezed off two shots at the men while taking cover. The gunman and his accomplice ran off. It is not known if either was wounded. Officer West injured his wrist diving behind a stairwell of the abandoned apartment building, according to police.